Very unique experience. It’s very different from the other resorts. The rooms were spacious and very well decorated. The staff were very friendly. Good selection of restaurants and beautiful view of the sunset. No lamps in the room but that was part of the experience. The staff lid candles in your room every evening right before sunset. I would definitely stay there again. My girlfriend and I had a lovely time! The rustic vibe was expected based on our experience and research. We were excited to disconnect and simply enjoy the giant treehouse that is Azulik. The Angels were our guides and they were truly angelic and helpful. Jesus, the restaurant manager, became our go-to for all dining questions and was a HUGE help in making our experience perfect (same with servers Manuela and Juan). Finally, the secluded beach area was simply divine. We honestly never left the property in our two full days there. The property was beautiful. Simple a work of art. The sky villa is where you want to be! It felt private, romantic, picturesque, and truly an experience. The location was great as well. We stayed at both ends of Tulum on this trip and preferred the end of the strip that azulik was in. The natural concept and the way the hotel is built is awesome. The location was great. And the hotel alone had a cool concept. The Japanese Rest was great so were the Angles. We visited about 10 years ago a couple times. Amazing experience!! Exceed our expectations. We stayed 6 days and use all the facilities. From the front desk Vicent, the bell men Daniel, the ‘angels’ Ara, Anna, Bebeto, the spa people: Emma, Alexandre, Fernando. Everybody at the Farm of the table restaurant and our server Luis. Kin to (restaurant) to make my birthday exceptional, Luis and Javier. Mauricio the housekeeper, Angel at the beach club, the maintenance guys and Andreas . The customer service made our experience even more special. Azulik This rating is a reflection of how the property compares to the industry standard when it comes to price, facilities and services available. It's based on a self-evaluation by the property. Use this rating to help choose your stay! Azulik is a private, adults-only beach resort and Mayan Wellness Center. It features a secluded, clothing-optional beach which is perfect for sunbathing or swimming. Each spacious tree house is made from Mexican-royal-ebony Khatalosh and features floor-to-ceiling windows providing natural daylight, mosquito nets. The tree house's also have a private deck with outdoor day beds, seating areas and views of the lush jungle and the Caribbean Sea. The rooms are free of TV's, phone or electricity so you can relax and reconnect with nature. 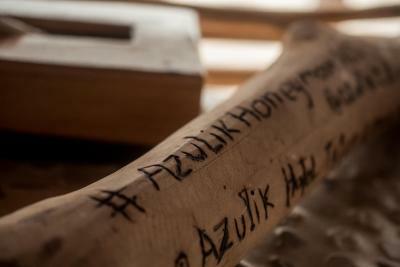 Azulik offers a magical experience, serving breakfast and lunch. Also a beach bar, a wonderful spa & beauty center. 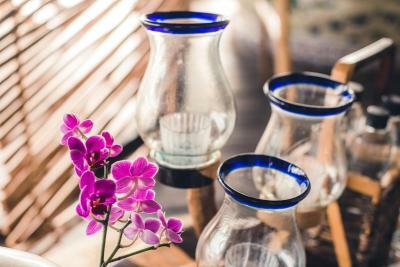 We also provide traditional Mayan massage and healing therapies, medicinal herbal baths and the traditional Mayan-sweat-lodge temazcal treatment. The units have a unique Mayan mosaic bath tub where you can have a special invigorating bath in rich mineralized cenote’s water, which is considered as sacred water within Mayan culture. 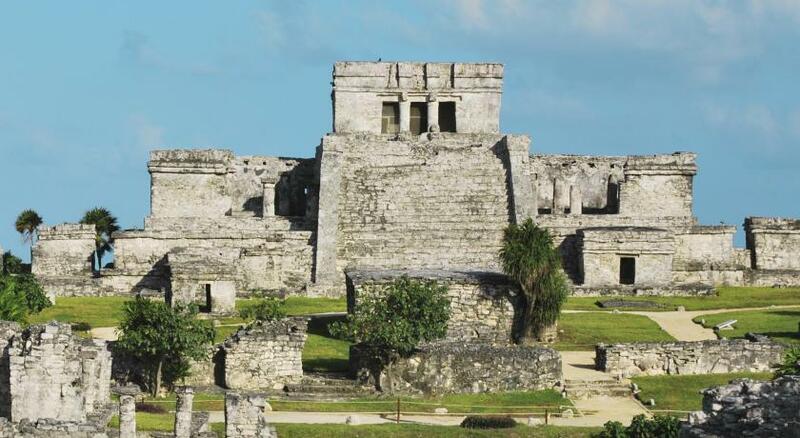 Azulik is 1.9 mi south of Tulum Archaeological Site and 2.5 mi from Tulum town center. Our Cancun International Airport is about a 90 minutes drive to Azulik's location. When would you like to stay at Azulik? Located on the ground floor on the cliff above the sea or on stilts above the beach, with views of the ocean. Has 1 king size bed with mosquito net. This villa, with no electricity, is fully constructed of fine local wood, with a large private deck to enjoy the sea view and a series of ceiling to floor windows to enjoy the Caribbean. Sea Villa has in-room bathtub as well as an exterior bathtub and a hanging rounded bed in the terrace. The Moon Villa offers one king size bed with mosquito net, a wardrobe and a hanging bed inside. This Villa, with no electricity, is fully constructed of local woods, with a large private deck to enjoy the sea view to the East and a series of ceiling-to-floor windows to enjoy the tropical jungle to the West. Azulik Moon Villa has in-room bathtub as well as an exterior bathtub and a big hanging rounded bed in the terrace. It also has private access to the beach. Amenities included : Express check in/check out, VIP round trip transportation from/to airport Cancun, one daily bottle of champagne and appetizers, place reserved on the beach, breakfast (set menu) served in the villa, one chef's table at KinToh, couple massages, yoga, butler service 24/7. Upper Floor Mayan style construction wooden villa, located on the cliff on the top floor. It has a view of the Caribbean Sea. The bungalow, with no electricity has a series of ceiling to floor windows. Sky Villa has in-room bathtub. Built by Mayan craftsmen using local wood to blend with the natural environment, Aqua Villa adds a romantic dimension to your holiday in a tropical seclusion, ideal for sheer relaxation in your own mosaic-style bathtub enjoying a view to the turquoise sea, making this villa the quintessence of Azulik. Aqua Villa, affords a wealth of luxury while allowing for personal customization depending on your requirements and sleek with its wooden floors and high ceilings and with a décor that reflects the natural beauty of the surroundings. Go barefoot into your own private accommodations sheltered by lush tropical vegetation and take pleasure with plenty of nice touches, such as : Amenities included : Express check in/check out, VIP round trip transportation from/to airport Cancun, one daily bottle of champagne and appetizers, place reserved on the beach, breakfast (set menu) served in the villa, one chef's table at KinToh, couple massages, yoga, butler service 24/7. Has a private terrace covered with plants and blooming flowers, while enjoying the perspectives. Mayan Villa has in-room bathtub. 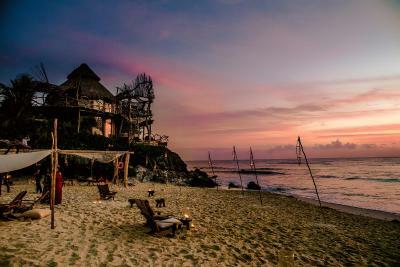 The Aztec Villa welcomes you in a wooden handcrafted space placed between the beach and the Mayan jungle, surrounded by the mystical energy of nature. Handcrafted with materials of the region, this villa invites you to reconnect with nature and simplicity through its textures and a terrace in the middle of the jungle with an outdoor tub. The Jungle Villa is surrounded by the powerful energy of the Mayan jungle. 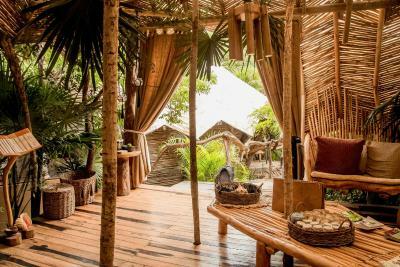 Handcrafted with materials of the region, this wooden villa invites you to reconnect with nature and simplicity through its textures and a terrace in the middle of the jungle with an outdoor hot tub. This bungalow has a balcony, hot tub and private entrance. House Rules Azulik takes special requests – add in the next step! Azulik accepts these cards and reserves the right to temporarily hold an amount prior to arrival. Please note that this is an adults-only resort and clothing is optional. Guests under the age of 18 are not allowed. Azulik Hotel is a nonsmoking hotel. Smoking in not allowed in any area including beach. Each cabin is for two adults maximum, no extra person is allowed. Please note that access of external food and beverages is not allowed. Although I welcome the idea of living a jungle life, I missed a shower and the AC after two days. It’s a unique experience. Loved the idea of the concept - living in the jungle! Resting in rooms without Aircondition & insects was impossible. There is no clean water for washing (only salt water) and the staff were unhelpful and rude. If you’re going to complain about things like rudimentary plumbing and minimal electricity (the hotel is lit by candles at night) then this is not the place for you. The room was a bit uncomfortable as the sink was squashed right next to the toilet. No space for getting ready with the mirror. Very hard at night as there is no light to see anything in the room. It’s a nice touch to have candles however if you are staying a long time it would be frustrating. Not a lot of privacy as people can see into your room. The smell of the ground is not nice...maybe some incense would help. The price was a bit high for the room we had compared to other luxury hotels we have stayed at. Amazing architecture, feels like you’re in a treehouse. 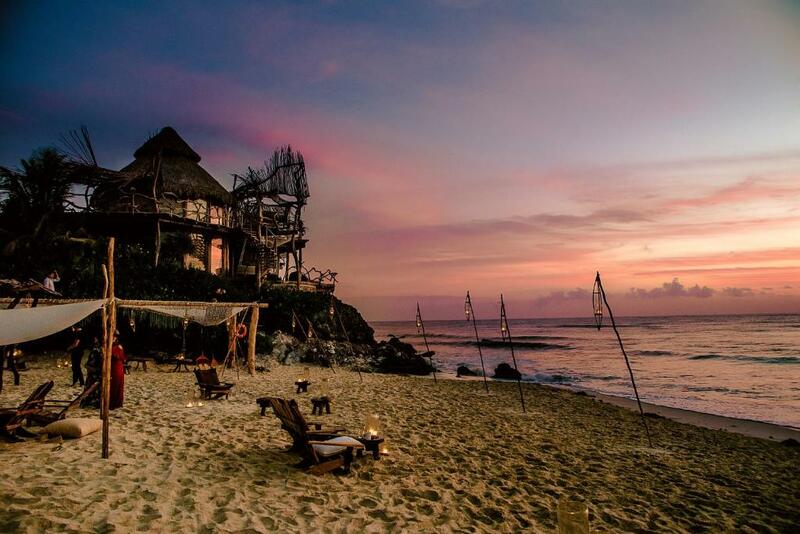 Great location on the main beach strip of Tulum. The food was delicious at the two restaurants we tried. Yoga in the morning was a nice addition. The hotel is an experience as there’s nothing else like it! The Bar was ridiculously expensive compared to literally anywhere else. $300 drinks & $2,500 shisha / argila? we had to go elsewhere after forking out so much money for the apartment. This is by far the biggest detractor and would stop me recommending to friends or going back again. 3x the price of drinks & 10x the price for shisha was absurd. Breakfast was incredible, the Yoga was incredible, the service was incredible. The hotel design & vibe was amazing. The staff was all about sales. The check-in process was anything BUT smooth. We booked a room online, which happened to be a jungle villa. We wanted to upgrade, and pay the difference, to stay in sky villa or a sea view room. The staff said there were none available. I looked online while standing in front of the receptionist and booking said there were 6 available. So, to prove a point I booked the room online right in front of them, and then at that point they said they would accommodate us. We basically paid twice to get the room we wanted, ($1100 for the jungle villa, and $1800 for the sky villa), when they could have easily just charged us the difference to upgrade from the original reservation. It was worth it for the experience of staying in the room, but not for the hassle of paying almost double. There is a really loud restaurant in the hotel. We came to this hotel looking for a quiet place, to disconnect, wich is the appeal of this hotel. It was quite frustrating to be in a non electricity room with all the loud music coming from the restaurant. The hotel must decide if they want to be a quiet place to disconnect or a place to party. The food in all restaurants was very good in all restaurants but it was extremely overpriced. While the angels were very helpful I found all other staff dispondondant and unhelpful, especially the restaurant staff. Who wouldn't seat us at the restaurant because we didn't have a dinner booking. The second time we went we were told theres a minimum $1000 spend per couple to be seated. Also i found it annoying to be asked for my room number every time i pass reception. The staff would benefit from customer sensitivity training. Especially the ones working in restaurants. We stayed in the Aztec room which was very beautiful and unique, surranded by nature. The rooms were large and comfortable. The bed was also spacious and very comfortable. The balcony had partial sea views with a large bath tub and swing. There was also a private indoor tub as there is no shower. Visually Azulik is a great place and therefore a lot of people stay or come to make pictures. I understand that the hotel positions itself as an eco friendly one but that doesn't justify the smell on the territory, lots of tourists wondering around, poor wifi connection in the rooms etc. For the price they charge they just have to try harder otherwise pictures are much better than real living experience. Do not come here with the great expectations otherwise you will be very dissapointed. This place is not better than most of the good hotels in Tulum. The place is simply way overpriced. The property is unparalleled. Beautiful and unique, the staff was friendly and helpful, the room luxurious in an eco-centric way. It was my anniversary and I booked far in advance to have something special done. Nothing was said or done for us. The staff was not helpful when I told them the smell of the dirty water was physically making me sick. I did not enjoy my stay. I ended up leaving half way through because the smell was so bad and they did not offer to change anything.